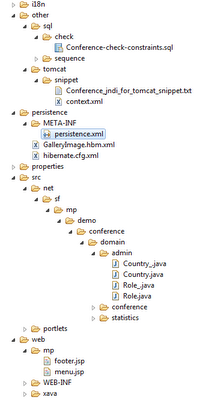 The goal of this article is to have a working Openxava on top of a data model by writting 0 (yes ZERO) lines of code. This application has to run as a standalone webapp or as portlets in a portal. The model used is the Lazuly-db which is a opensource database hosted on googlecode that represents the structure of a database holding conference related informations. Lazuly-db will be used as a showcase of various MinuteProject technology tracks. In version 0.1 it has 13 tables, 2 views. This article explains the different steps to quickly have a create an Openxava application. It is furthermore a tutorial on how to enrich the database model to get customized Openxava artifacts providing specific behaviour. The purpose is to give to user enough material to customize it and go on extending your model. If you want to see the result quickly, I encourage you to see the videos (downwards on this page). Is an opensource product that makes CRUD RIA modal application in a very quick way. It enforces the DRY principle with a comprehensive set of annotations. Openxava is a generic framework that dynamically generates the presentation layer based on custom annotation. MinuteProject 4 Openxava offers a reverse-engineering solution targeting OX architecture. MinuteProject works with a configuration file. This file holds the information regarding the model and how to enrich it. It also specifies the target bundle of templates for a technology track (here Openxava). 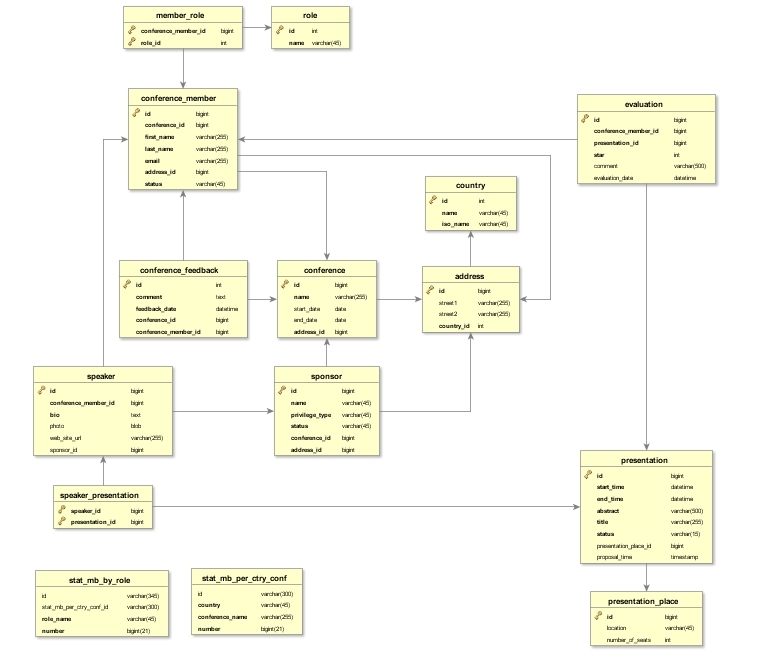 Lazuly DB main entities: The schema below resumes the lazuly DB main entities (tables/views) and theirs relationships. 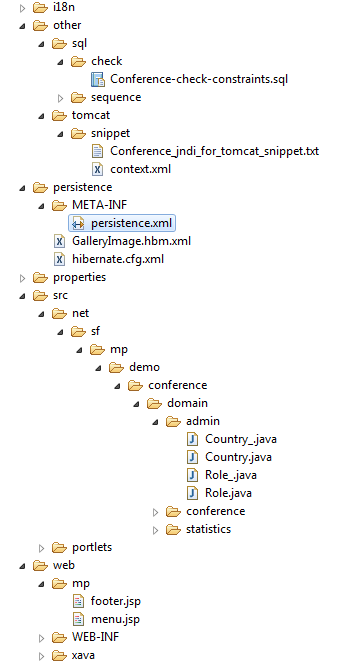 On MP 0.8.2 the semantic reference node on 'CONFERENCE_MEMBER' entity is to comment. If you have read the minuteproject 4 JPA2 lazuly showcase article on this blog, you would notice that the configuration is similar to the one for JPA2 track. It is the case for everything regarding the model location (same model) and the enrichment, meanwhile it defers regarding the target, since it uses OpenXava. business packages: entities starting with stat go to 'statistics'...;role, countries goes in administration package. Those will be converted into distinct menu tabs. Entity (views) enrichment by providing them a primary key (create a unique key) by adding foreignkey. In this way we can have an alternative navigation model on top of some BI views. Tag field content-type="reference-data" apply to ROLE and COUNTRY entry will trigger the following navigation behavior: you cannot navigation from a role entry to children CONFERENCE_MEMBER in the application, but form CONFERENCE_MEMBER you can associate roles. Download and install minuteproject 0.5.5. Minuteproject is installed in MP_HOME. Download and install openxava 4.1.2. Openxava is installed in OX_HOME. This demo is based on OX 4.1.2, if you are using a more recent version there may not be foreward compatibility. Release (MP 0.5.6 will be compliant with OX 4.2.1). In fact there is one artifact generated home.jsp that is based on OX module.jsp. If this artifact changes between OX release, there is potentially an error. check that the system variables: ox_home, mp_home are set to Openxava and MinuteProject installation directories. Open a prompt on /DEV/output/openxava/conference, and execute build-conference.cmd. Start you default browser to the Conference Home menu. Google code only read only. please provide it.